A while back I was presented with an album promo for Great Olden Dynasty by Italian metal act Genus Ordinis Dei. I really dug it, and I still listen to it now. You can read my review and an interview I did with the band here and here. Anyway, the band just released a cover of Manowar‘s classic anthem Hail and Kill for your listening pleasure, and it’s pretty damn good too. Symphonic death metal quartet Genus Ordinis Dei has revealed a brand-new music video for their latest single, Hail and Kill. The song, which was originally written and recorded by the legendary metal band Manowar is out now via iTunes, Amazon, Google Play, Spotify, Apple Music, Deezer, Pandora, iHeartRadio and more! The video was directed by Steve Saints. here is the latest music video and single from the band since releasing their full-length album Great Olden Dynasty in November of 2017. The album received critical acclaim from dozens of media outlets worldwide and features Cristina Scabbia from Lacuna Coil on guest vocals for the song Salem. 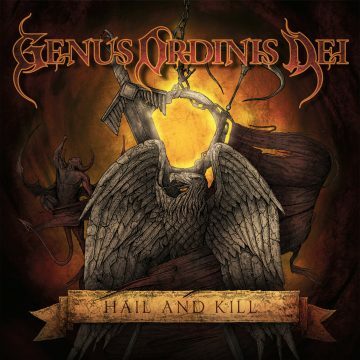 Hail and Kill Manowar Cover by Genus Ordinis Dei is now available on iTunes, Amazon, or Google Play, and stream it via Spotify, Apple Music, Deezer, Pandora, iHeartRadio and more! Where are the loincloths?? Boooo!! !